Carl Chang’s Pieology has been dubbed the “Chipotle of Pizzas” after the concept initiated by Chipotle Mexican Grill: the customer customizing the food that he/she wants. With Pieology, you simply choose the crust, cheese, sauce, and toppings you prefer and your pizza gets popped up in an oven for five minutes and then served at your table. The thing is, it will be a lot of hits and misses for some people in spite of the plethora of ingredients that, in the right combinations, would make an awesome pizza. Pieology has the 3-Cheese Alfredo, barbecue, olive oil, herb butter, fiery Buffalo, pesto, and the House Red which you can choose from to make your pizza’s sauce base. This selection has apparently given Pieology a big edge over its competitors. Mad to Meat You has meatball, Mozzarella, olive oil, Pepperoni, House Red Sauce, and garlic; Artichokes, grape tomatoes, fresh basil, olive oil, mushrooms, Mozzarella, 3-Cheese Alfredo sauce, black pepper, Parmesan, and garlic make up Alfredo’s Alfredo; and Rustic Veggie has fresh basil, House Red Sauce, red onion, Ricotta, roasted red peppers, corn, olive oil, green peppers, and garlic on whole wheat crust. The successful combinations which a customer can make are endless with 33 available toppings but, as mentioned earlier, there may also be disappointing duds. 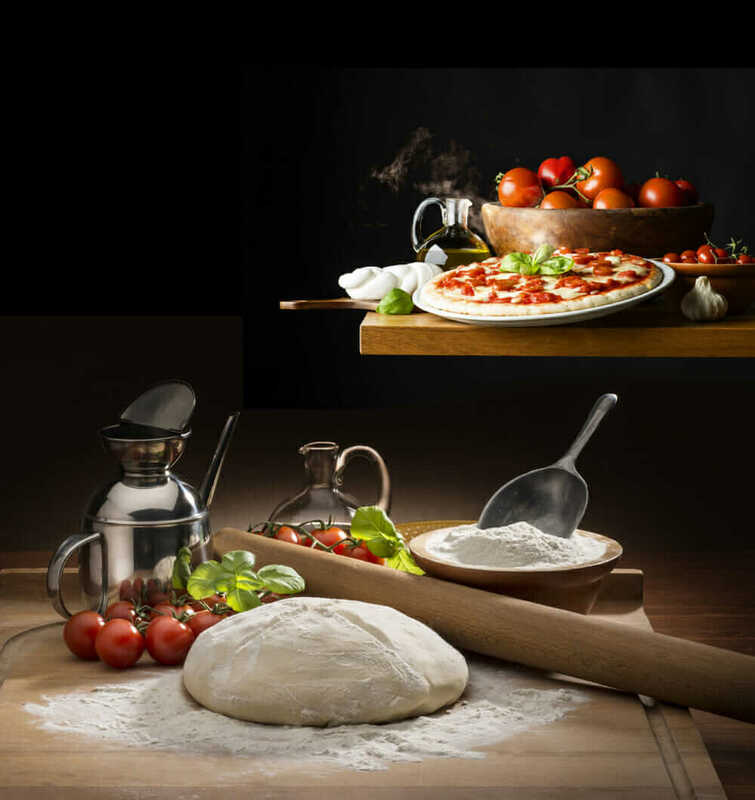 Okay, so you don’t have to be Italian to come up with an edible, albeit not overwhelmingly memorable, pizza but knowing which ingredients taste better together or how much of what you should or shouldn’t put together can go a long way in enjoying your pizza. According to Pieology CEO Carl Chang, brother of tennis superstar Michael Chang, Pieology continues to perfect and refine its original business model without having to worry about catching up with the newer players on the scene. Pieology’s dough, for instance, is made fresh daily at each Pieology store with specific instructions that use proprietary sauces pre-packed from a single distributor to retain consistency. Prices for customized pizzas start at $7.95 but these are the least of Pieology’s features that have given customers a strong reason to come back. Pieology’s “flavor blasts” – the add-ons to the pizza such as pesto or Buffalo sauce, olive oil, and roasted red peppers, among others, after it has been cooked to crisp perfection – are what spell the difference between Pieology’s great pizzas and the ho-hum varieties of other brands. Chang, who was on a full tennis scholarship at the University of California’s Berkeley campus, was a full time coach to kid brother Michael, the youngest single male Grand Slam winner until he decided to use the business degree he obtained in college. Carl Chang began a career in property management and firm brokerage that included clients such as Costco, Starbucks, Home Depot, and Target. In July this year, Pieology officials announced that they have been conducting tests to customize salads. According to Chang, Pieology has opened the 61st restaurant in its chain and hopes to open 110 more locations before 2015 ends. Building your own salad should be just as fun, if not as delicious-tasting as building your own pizza. Freshly-made salads have always been on the Pieology menu, albeit these were pre-packed. Ten to a dozen ingredients will be available to make different salad combinations but Caesar or signature classic salads would still be available for customers who want to personalize them with their choice of toppings. Customized salads built by customers, that will be generously portioned, are being priced at $9.95. And, according to Chang, if the salads perform as expected in the tests, they will be rolled out system-wide. New décor is also being tested which includes placing inspirational quotes on walls and using wood as a primary décor material. Menu boards now include specials as well as offers on limited time availability. There are even explanatory sections such as how salads and pizzas work Pieology style. All of these innovations are Pieology’s initiative to make people feel good.